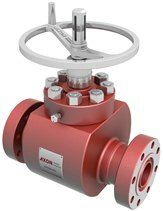 Designed to work specifically in mud service operations and standpipe manifolds during drilling operations, AXON’s Type 46 Mud Service Gate Valves are rated up to 7500 psi. The Type 46 Mud Service Gate Valve is a bi-directional sealing gate valve utilizing industry-proven designs and materials. Furthermore, the open conduit design allows for body clean out by flow through the open valve.